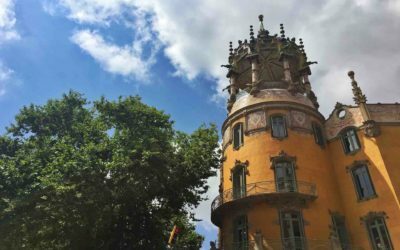 After basing ourselves in Gracia Barcelona for 3 months, we fell head over heels in love with this neighbourhood. It’s one of the most distinctive and individual districts within this fantastic city, and possesses a completely unique vibe. The Gracia district of Barcelona is low-key, bohemian, leafy, and ever so slightly hipster. And at its heart is an independent feel. We think it’s the best area to stay in Barcelona to get a taste of laid back local life. But better yet, it still offers easy access to all of the best things to do in Barcelona. Gracia Barcelona used to be an independent town right up until the late 19th century. That’s right, it never even used to be a part of Barcelona. But as the city expanded it swallowed up the space in between the city proper and this tight knit town. Eventually it was incorporated into the city as a neighbourhood of Barcelona along with a number of other municipalities. 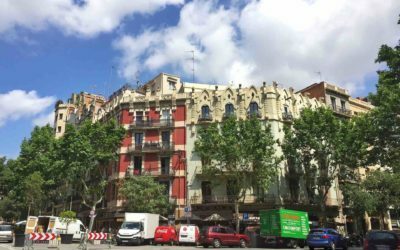 This history gives Gracia Barcelona a very different feel to the more central parts of the city. You can sense that it still considers itself as somewhat separate and thankfully it’s managed to retain its individual character. One of the biggest selling points of the Gracia neighbourhood is that it’s packed full of superb restaurants. Forget about the overpriced, underwhelming establishments found in the touristy areas peddling their insipid paellas and unpalatable, generic fast food. 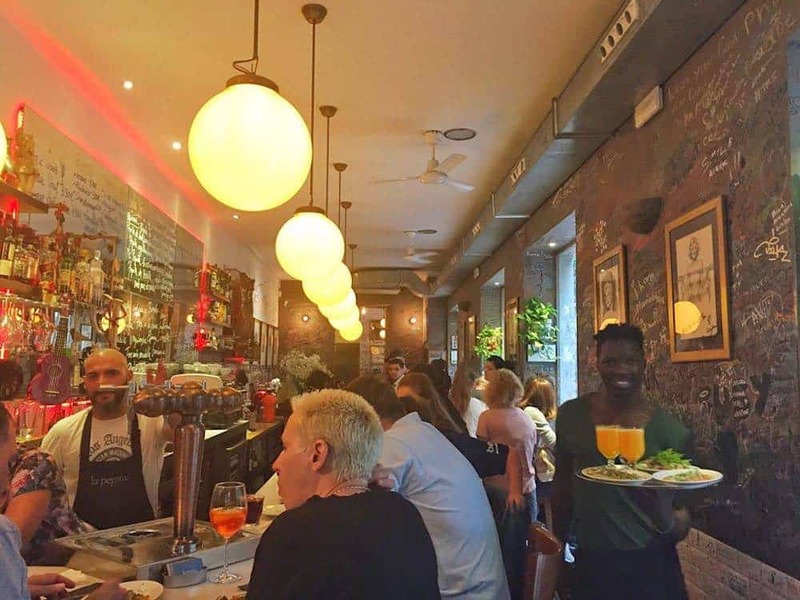 The eateries in Gracia Barcelona are overwhelmingly independent and cater to a local market rather than the tourist dollar. It’s the perfect place to sample dishes from the Catalan region and the rest of Spain. But its food scene is also extremely diverse meaning you can feast on cuisines with influences from all over the globe. There are tapas bars, pintxos joints, hole in the wall pizza outlets, Syrian kebab hawkers, and everything in between. While there are some high end restaurants, almost everything in Gracia is reasonably priced. Put simply, Gracia Barcelona is a foodie’s paradise. It’s somewhere you can’t miss if you’ve got any interest at all in what you stuff in your gob. Want to know our favourite places to dine in Gracia Barcelona? Check out this guide on which restaurants not to miss. In addition to some of the city’s best restaurants, Gracia Barcelona boasts some top notch watering holes. The nightlife here is far removed from the superclubs and late night venues that you’ll find more centrally located. Instead it’s about small bars, traditional bodegas, and chilled out alfresco good times. Similarly to with the restaurants Gracia’s bars are largely independent, locally run, and all the better for it. Aperitifs are big news here so be sure to take one before your evening meal. 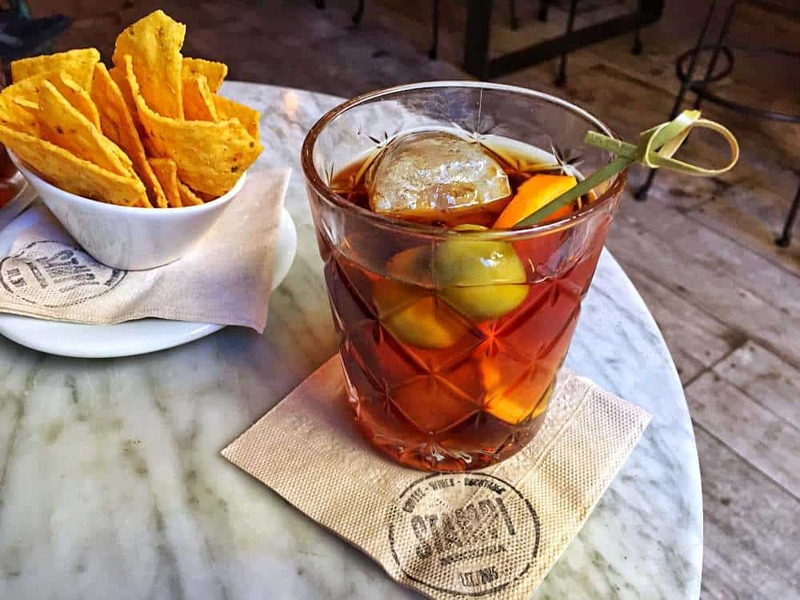 A good bet is local favourite vermouth, garnished with a slice of orange and anchovy-stuffed olive. You’ll find hip wine bars serving a wide range of delicious local vintages for a few Euros a glass. There are rough and ready beer holes and bodegas churning out small glasses of Estrella for a Euro a pop. And if you’re into something a bit more sophisticated, try one of the many cool cocktail joints peddling everything from Aperol Spritzes to Mojitos. There’s also a strong and lively cafe culture with many establishments having cute outdoor seating areas. If you enjoy chilling out with a quality coffee and tasty pastry then you’ll be spoilt for choice. 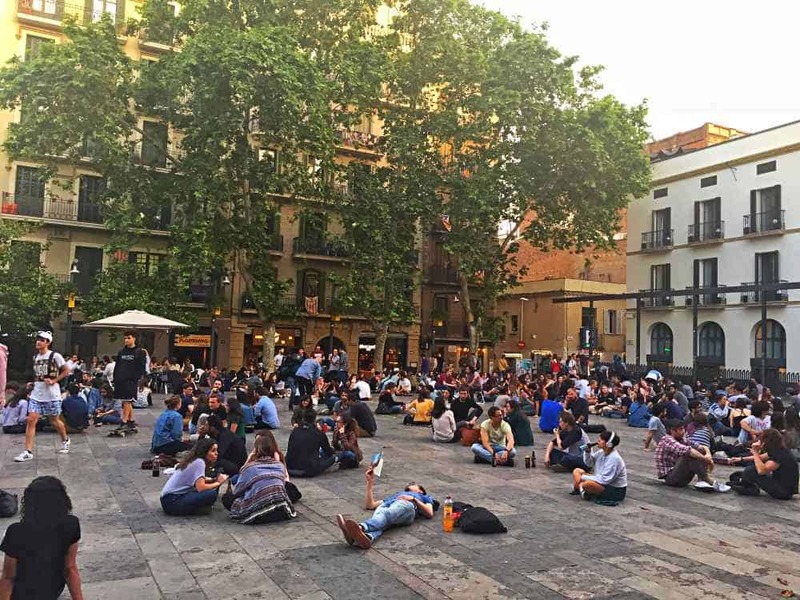 Rest assured, if you like getting out and being social, Gracia Barcelona has got you covered. 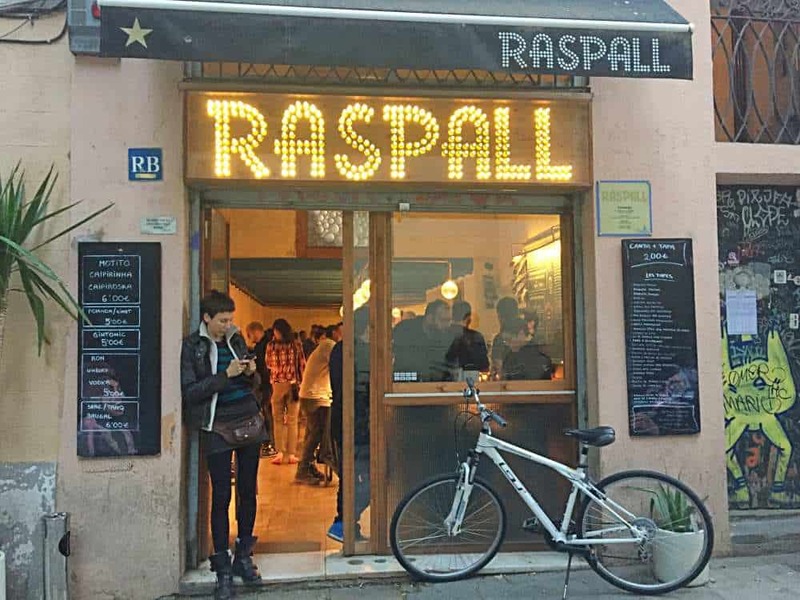 For the lowdown on where to check out, take a look at this post on the best bars in Gracia. Gracia Barcelona isn’t packed full of attractions. It’s more of an attraction in itself, as much as a neighbourhood can be. 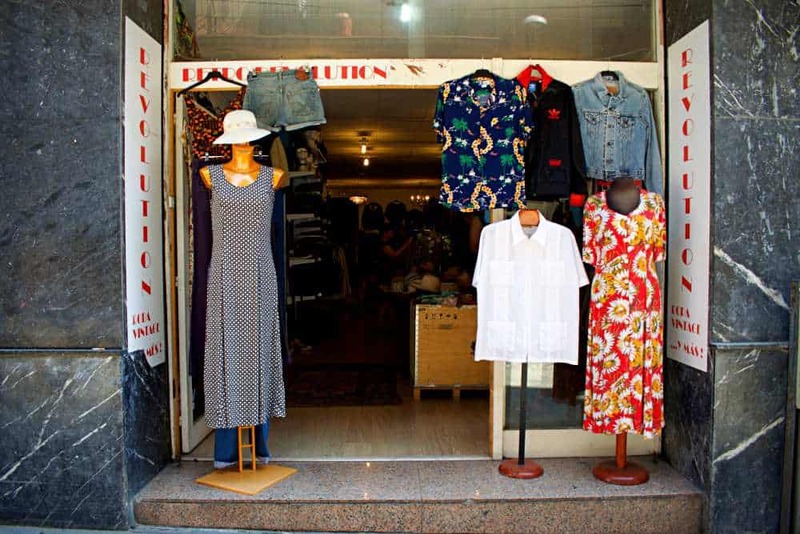 Despite that there are plenty of things to do in Gracia Barcelona, here are our top picks. As one of Barcelona’s most famous attractions, Park Guell is probably Gracias biggest claim to fame. 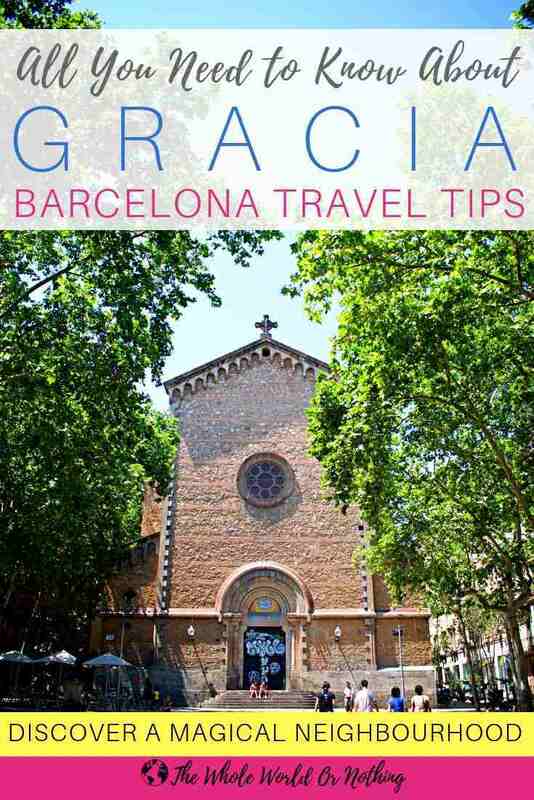 However, many people visit on a tour without even realising they’re in Gracia. 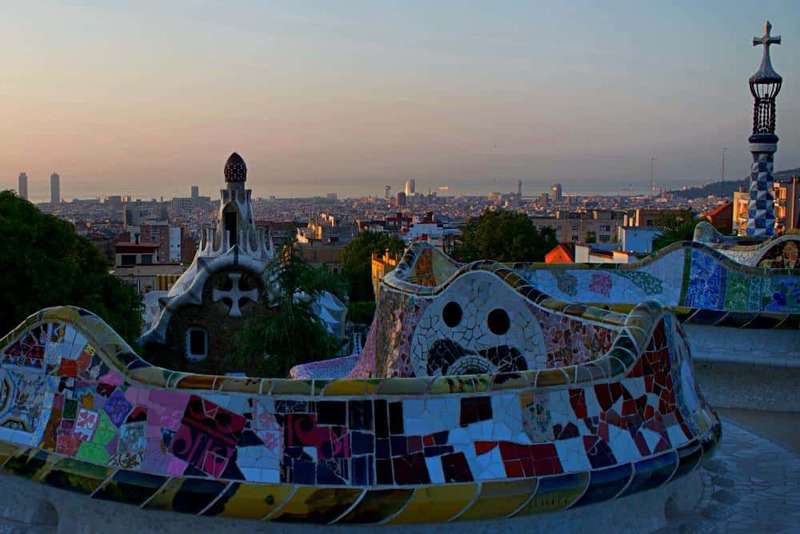 Sitting atop Carmel Hill, Park Guell is a masterpiece of renowned Catalan architect Antoni Gaudi. His enigmatic designs define the city’s architecture, and this park is one of the crowning jewels in the collection. The surreal shapes and forms turn this park into a magical wonderland. On top of this, the views over the city, framed by the park’s colourful balconies, are truly breathtaking. Check out this post on visiting Barcelona on a budget to find out how to get entrance to Park Guell for absolutely nothing. Gracia Barcelona is famous for having some of the most picturesque squares in the city. But not only are they pretty, they’re packed with people all throughout the day. Groups of friends sit and enjoy their lunch in them. Families take their kids to the squares to run around, ride skateboards or for a spin on their bikes. And come the evening they turn into huge, open air bars with performers putting on shows and playing live music. 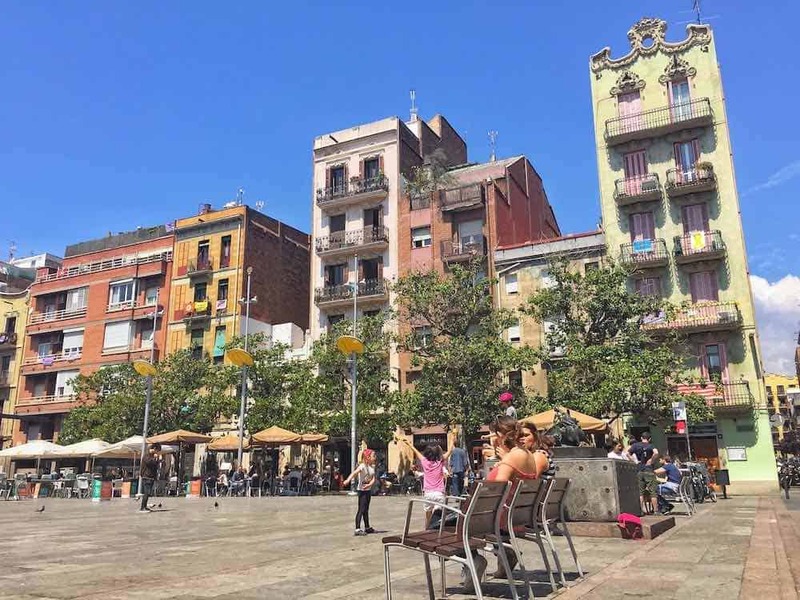 The stunning Placa del Sol is the most popular and well used square in Gracia Barcelona. It’s lined with nice bars and restaurants with outdoor seating and a great place to relax. However, most people just buy a beer from the surrounding shops and take a seat on the floor. Placa Virreina is overlooked by the beautiful Sant Joan church on one side, with cafe bars running along its sides. This is more of a daytime hangout where people go for a coffee or glass of wine. The steps of the church are prime seating here providing a wonderful vantagepoint to watch the world go by from. Placa de la Vila de Gracia has a beautiful old clocktower at its heart that rises above the surrounding restaurants. 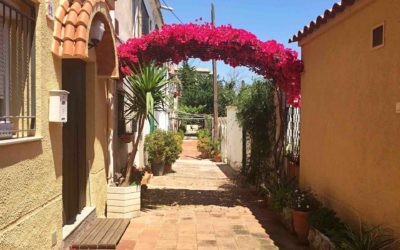 It’s a great place for alfresco dining and a little quieter than Virreina and Sol. There are also plenty of other smaller squares like Raspall, and Place del Diamant which have their own individual charms. There’s a long running tradition in Barcelona for each neighbourhood to hold its own annual street festival. By all accounts Gracia’s party, Festa Mejor, is the biggest and the best in the city. Unfortunately we didn’t manage to go as we weren’t there at the end of August when it happens. However, we did witness a number of other fantastic street festivals in Gracia. So many it felt as though there was something going on every other weekend. There was the wild all night parties of the festival of Sant Joan. There were wine festivals, food festivals, religious festivals, and more. 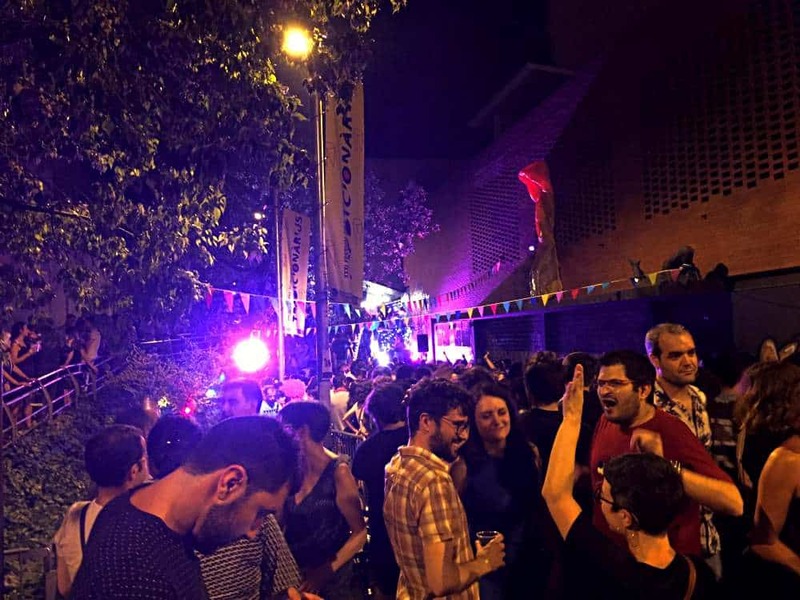 Gracia doesn’t need an excuse to party, the street gatherings are regular and lively. Maybe it’s a rainy afternoon and you don’t fancy being outside. Perhaps you want a relaxing date evening with your other half. Or possibly you’re just looking to catch a good flick and don’t need an excuse. 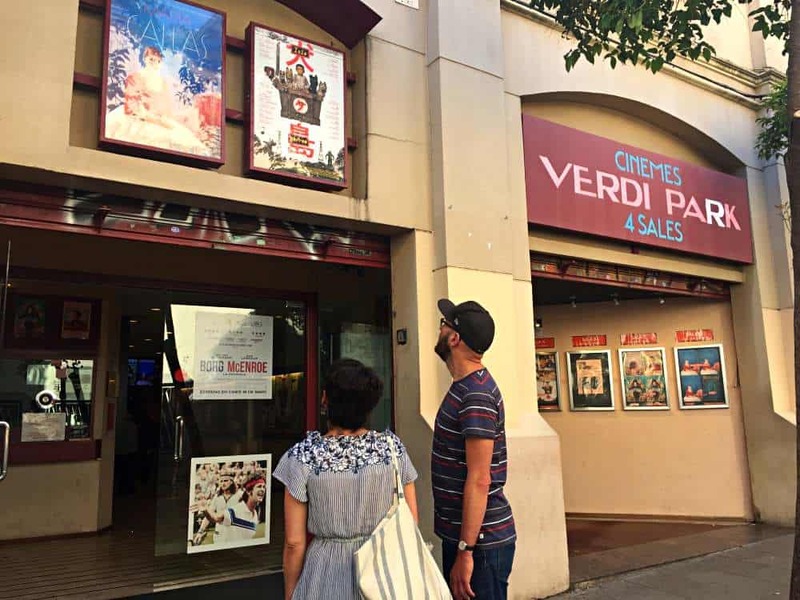 Gracia Barcelona is home to the awesome Cine Verdi which screens a wide variety of movies in their original languages. There’s a focus on indepie-type films (very fitting for the area) although you do get the usual blockbusters as well. Refreshingly, for a cinema the snacks are cheap as well! So you can scoff away at a box of popcorn without putting a hole in your wallet. There are a disproportionately high number of art galleries in Gracia Barcelona. You’ll find little independently run galleries and exhibitions tucked away down many of the little backstreets. But you don’t have to go to the galleries to soak up the creativity of the neighbourhood. In fact many of the streets resemble outdoor galleries as well thanks to the brilliant street art on display. The Gothic Quarter is packed full of your international high street stores. And you should hit Passeig de Gracia if you’re on for some serious high end fashion houses. But Gracia Barcelona is the best place in the city to go for something a bit different. It’s full of independent fashion stores and privately owned boutiques, not to mention cracking vintage shops. A lot of the city’s best up and coming designers sell their wares here, but it’s not all clothes either. If you’re in the market for unique gifts or house decorations to take back with you there are fantastic options. You’ll find craft stores, furniture workshops, accessories outlets and a wide range of curiosities. The best place to start is Calle Verdi, Gracia Barcelona’s main street. Even if you’re not about the shopping you’ll still be drawn by the beautiful store designs and trendy merchandise. You won’t find any of the big international hotel chains in Gracia Barcelona. However, there are plenty of funky boutique hotels in the area. To really get into the local life a great option is to rent an apartment. Or alternatively you can rent a room in someone else’s apartment which is what we opted for. Airbnb is our trusted go to booking site when we want to stay in an apartment or private room. If you haven’t used Airbnb before you really should check it out, there are some beautiful homes on there. If you’re not already signed up then use this link and you’ll receive a discount on your first booking. One of the great things about Gracia Barcelona is that you’re removed from the chaos of the busiest areas. However, thanks to its great transport links, all of the main sights and attractions are easily accessible. It’s serviced by three metro stations, Fontana, Lesseps, and Joanic, running to separate parts of the city. Fontana and Lesseps are on the Green Line 3, while Joanic is on the Yellow Line 4. There are also a variety of busses that run through Gracia, the most useful of which is the number 39. It goes past most of the major landmarks and drops off at all of Barcelona’s beaches. Additionally, if like us you’re into exploring by foot, Gracia is within easy walking distance of many destinations. The Sagrada Familia, Bunkers Barcelona, Passeig de Gracia and many more attractions are all just a short stroll away. 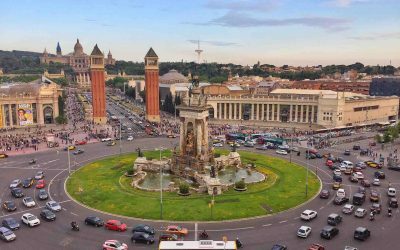 Even city centre sights like La Rambla and the Arc de Triomf are under 3km away. This Gracia Barcelona map should give you the scale of the neighbourhood and an indication of how central it really is. 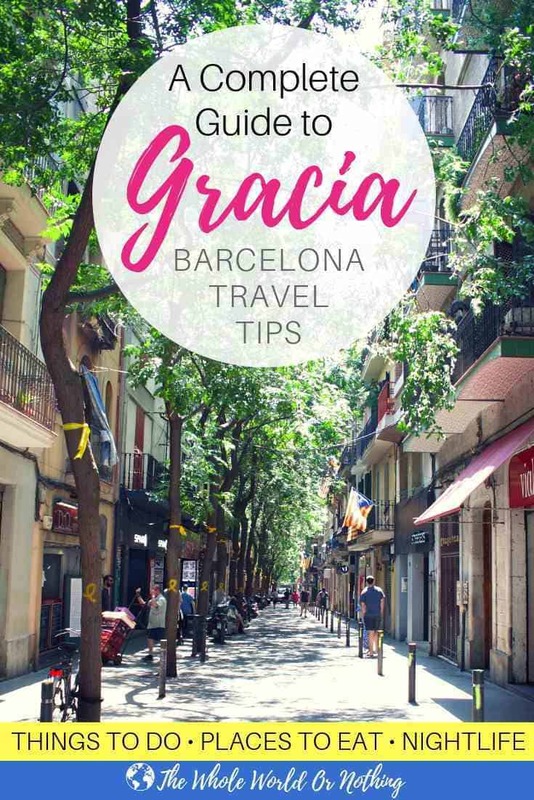 Heading to Gracia? If you’ve got any questions about the neighbourhood hit us up in the comments below and we’ll do our best to help. I loved Parc Guell, however I was there some 15 years ago and probably wouldn’t go back now that it has become a major tourist attraction. However, if I do, I’ll definitely follow up on your tips on how to get in for free! Hey Kimberly, it’s definitely a super cool neighbourhood and hanging out in the squares was one of our favourite things to do too! Gracia looks like a cool and colourful district to hang out in when visiting Barcelona. It sounds like the kind of place you’d easily make friends and meet locals. Renting an apartment seems like a good option here. Will check it out. Hi Christina, you’re so right, we made lots of friends while we were there and met tons of great people. 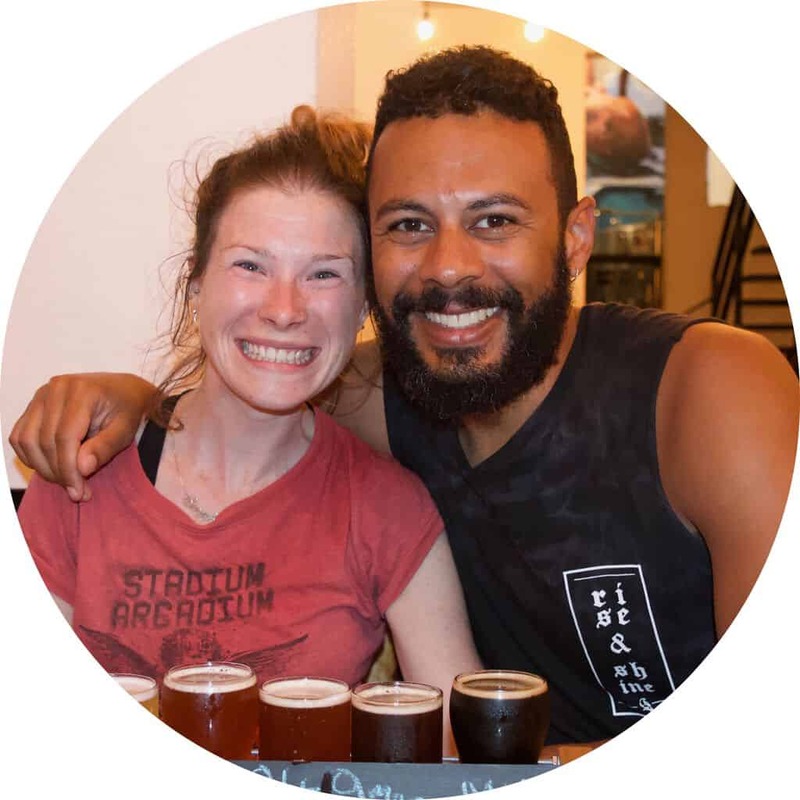 It’s nice as well that most of the businesses are independent because you can get to know the restaurant and bar owners and they welcome you like old friends when you go back again, it’s got a real local community feel. Great tip on Barcelona! Gracia does indeed look like a real-deal, non-pretentious, hipster hub. 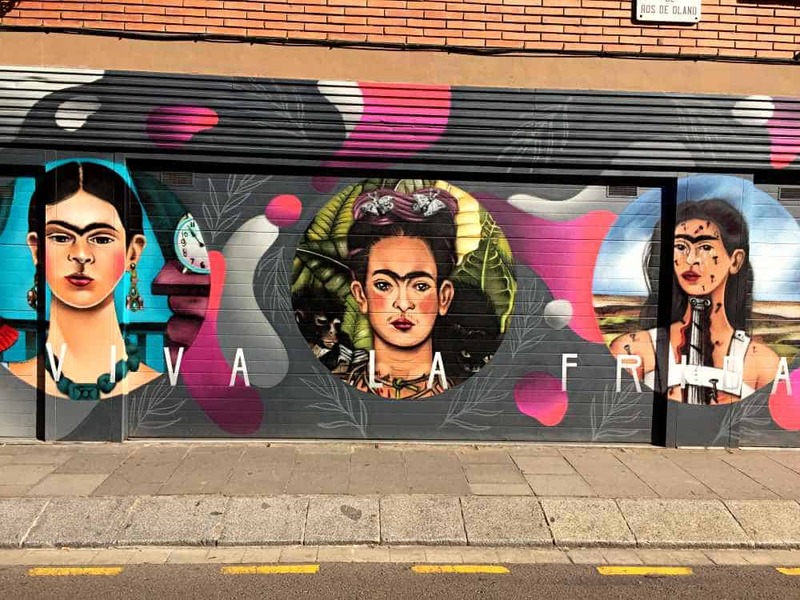 I’ve not been to Spain but I imagined it as simply ‘historic’, so it’s refreshing to read about a real Barcelona community rather than its top 10 museums or luxury hotels. I’d love to check out the art scene there or learn more about the local cuisine. All looks scrumptious! Hey Vanessa, yes Gracia is a fantastic place to stay or visit in Barcelona it’s got such a lovely atmosphere. You’ll definitely love the art scene and food if you do visit one day, they’re both awesome. I’m glad you enjoyed living in Catalonia so much. We stayed in Palamos for ten weeks back in 2012. It’s a small town about 80km north of Barcelona but it still has the primary Catalan dialect. We went to Barcelona for a few days and loved Parc Guell. That paella you had looks superb. Really miss the authentic stuff. Hi Rhonda, Palamos sounds like a nice place to visit, we also went to a few other towns and cities in Catalonia and really enjoyed them all, it’s such a stunning region. Oh and that paella was indeed delicious 😉 thanks for stopping by. Not only is Park Guell within Gracia Barcelona, Sagrada Familia is nearby, too! Gracia Barcelona is indeed the place to stay! I loved this part of Barcelona. It was such a fun neighborhood with so many great things to do and eat! I wish I had known about the theater, would have been fun to catch a film in Spanish! Yeah we may be a little biased because we there for 3 months nearly but we think it’s definitely the best area to stay in Barcelona. 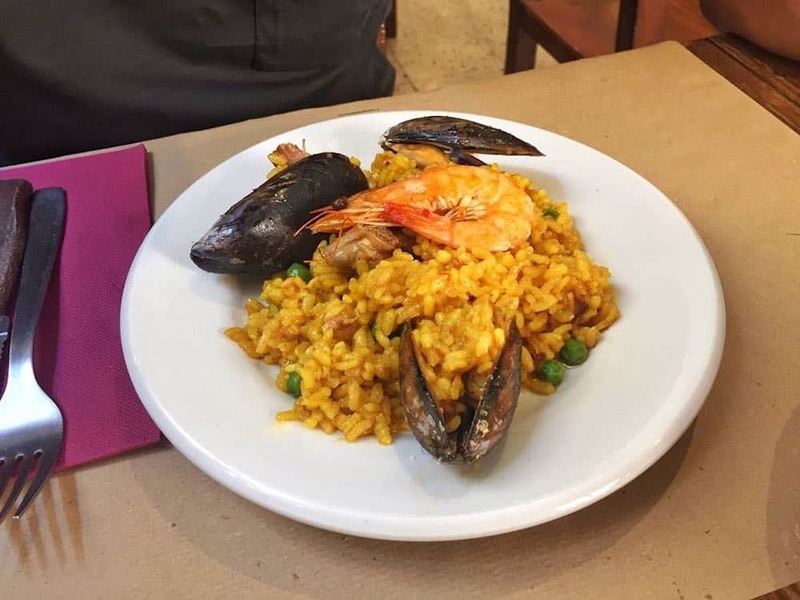 I visited the Gracia neighborhood on a Devour Barcelona food tour and this was definitely where I had all the best food on my short stay in Barcelona. I was the opposite though – I didn’t realize that Park Guell was in this neighborhood! Ha ha! Yeah it’s usually one way or the other. Glad you enjoyed Gracia, we love it there so much.